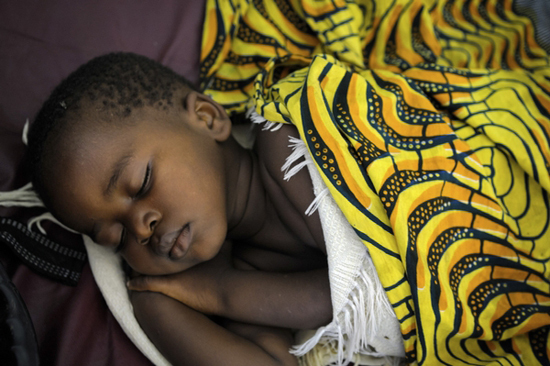 Severe malaria put 18-month-old Bahati in a coma before he was treated at MSF's hospital in Kimbi Lulenge health zone. Like Bahati, three-year-old Jean Marc is being treated by MSF for severe malaria. This post originally appeared on the Guardian's (UK) "Poverty Matters" blog. 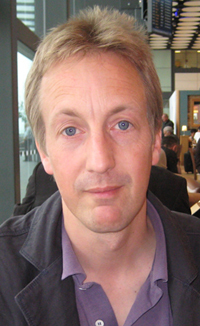 Chris Bird, a former Reuters and Guardian reporter, put down his notepad and left more than 10 years of news reporting to study medicine with the intention of returning to the front lines where he can be hands-on saving lives and alleviating the kind of suffering he once wrote about. As the sun went down and the ridges of the Mitumba mountains turned a smoke blue, a line of mothers sat quietly on a wooden bench in front of the nurses’ station in the pediatric tent. The children lying prostrate in their laps were new admissions, too weak to protest against the nurses, who wore miner's headlamps to help search for a vein to place a drip. These children have “severe malaria,” a combination of signs and symptoms, lab results (if you have them), and infection with one type of malaria parasite, Plasmodium falciparum. After the parasite has invaded via the drill-like proboscis of a blood-hungry female Anopheles mosquito, the falciparum parasite replicates fast and, like a microscopic wrecking ball, smashes red blood cells and leaves children breathless with severe anemia and sticks to blood vessels in the brain, causing seizures, coma, and death. Time is everything—delay treatment and the parasites multiply unchecked and the child reaches a point of no return. Lejuif—the nurse on duty—and I started with the sickest looking child, 18-month-old Bahati. His feet were cold, signalling he was in shock. He didn’t respond when we rubbed him vigorously on his chest—he was in a coma—and his chest heaved up and down. He had severe respiratory distress. His hemoglobin, the measure of how much oxygen his red blood cells could carry, was very low. He needed an immediate blood transfusion. We rushed him under a crowd of stars between the tent and the single story building containing our intensive care unit (ICU). The unit has an oxygen concentrator, which we used to help him breathe while we placed a drip, gave anti-malarials, and arranged for a transfusion. Families have to donate blood if a child needs a transfusion. Bahati’s mother had walked from the gold mining town of Misisi, 15 kilometers down a dirt road, and her partner had not accompanied her. As she was pregnant, she could not donate. There was no suitable blood in the hospital freezer. Wilondja, another of the nurses, went back to the pediatric tent and persuaded another of the parents to give blood. We also started antibiotics as we had no means of ruling out meningitis or another blood infection, especially as Bahati had had a traditional treatment the previous day where his uvula had been cut out. Political will and funding to buy bed nets, insecticide spray, and medications that both cure malaria and stop onward transmission of the disease have saved many children’s lives in Sub-Saharan Africa. There is now hope for a vaccine. Experience in the Kimbi-Lulenge health district would seem to bear out evidence from the World Health Organization’s latest World Malaria Report (2011) that the Democratic Republic of Congo (DRC) is defying the trend and cases are actually rising. MSF treated 15 percent more malaria cases in South Kivu in the first two months of 2012, compared to 2011. However, the new project in Kimbi would also fit the WHO’s assessment that better access to treatment has seen the recorded numbers rise in a population which is remote, made even more remote by a smoldering war. In MSF’s more established operation in the town of Baraka, on the shore of Lake Tanganyika, the proportion of under-fives presenting with severe malaria in January and February this year totalled 9.3 percent. In Kimbi, this proportion was 25 percent. The difference is most likely timely access to health care. Much of the population around Baraka can now get to primary health care centers that have reliable stocks of anti-malarials. In remote Kimbi, a project which only started last October, MSF has had to overcome complex supply issues. But it has now started supporting health centers such as the one in Misisi so that children like Bahati can find treatment closer to home before they get so ill.
Bahati had a stormy course and remained in a coma, with periodic seizures, for two days. His name in Swahili means “luck,” and with the care of the nursing staff in the makeshift ICU, he pulled through. But thousands of children in the DRC will die from malaria this year, a disease that is both preventable and curable.